Wheel thrown glazed earthenware clay bowl with extended knob handle, open at the end. Unglazed base. Brown glaze to bowl, handle end in brown, but with a blue overglaze to the rest of the bowl. Vinnies, Oakleigh, 1st Feb 2014. This ramekin was made at the Old Cheese Factory Craft Centre, the largest privately owned craft centre in Western Australia. 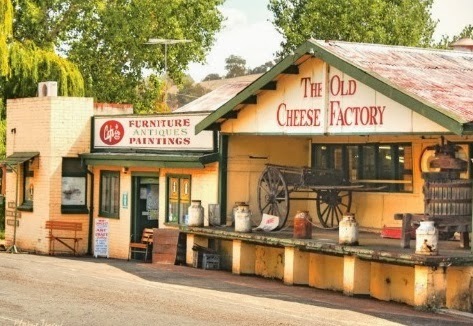 Originally the Manjimup Dairy Produce Company Ltd, established in 1933. It is located about 500 metres off the South West Highway on the Nannup Tourist Drive. After changing hands a few times over the years, it became a craft centre in 1979 when it was purchased by Stephen Cox and potter Beverley Smitchens, producing works in ceramics, timber, wood turning, furniture as well as Aboriginal art and handcraft. They sold to Des Milburn in 1985 and later Jennifer Taylor in 1985. In 1997 it was bought by Mary Kent and also sold antiques and collectibles. 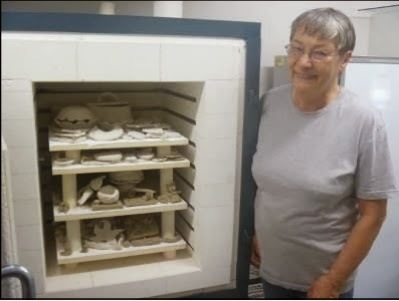 Potters Wendy Wishart and Gary Hambleton operated there before Gary moved to the nearby “Old Stables Pottery ” at Mallinyup. This ramekin does not look like the work of either of them, but bears the printed label “Hand Crafted The Cheese Factory Craft Centre Ballingup W.A.” These is also a stamp “Cheese Factory” on the foot ring.